If you love the Zac Brown Band, we’ve got some exciting news for you!! They’re on tour yet again in 2019, following the popular demand from their relentless touring schedule from last year!! With special support acts yet to be announced, they’re playing the Hollywood Casino Ampitheatre on Saturday 29th June 2019 – be there!! Tickets on sale now, but not for long – grab ‘em while they last!! Formed in 2002, the Zac Brown Band are one of the best-loved big groups in country. Over the years, the band have had an ever-growing number of number one hits you’ll all be familiar with; “As She's Walking Away”, "Highway 20 Ride", "Colder Weather", "Keep Me in Mind", "Goodbye in Her Eyes”, and of course, “Chicken Fried,” just to name a few. They also have several platinum-selling albums; “You Get What You Give,” “Uncaged”, and “The Foundation,” which has been certified triple-platinum by the RIAA. The new tour, according to the band, is based around "the mythology and mystery surround the great horned owl that can see perfectly in the night, serving as a guide when we need sight in even the darkest of moments,” leading to some new themes and sounds that will feature in the upcoming tour. Are you excited for this concert?? We sure are!! 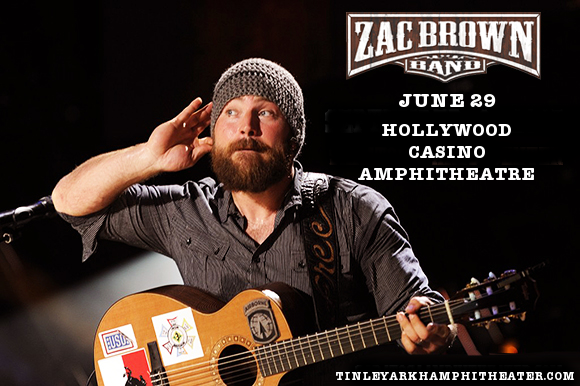 Make sure you get your hands on those tickets for the Zac Brown Band on June 29th at the Hollywood Casino Amphitheatre quick – they’re not expected to last for very long! !